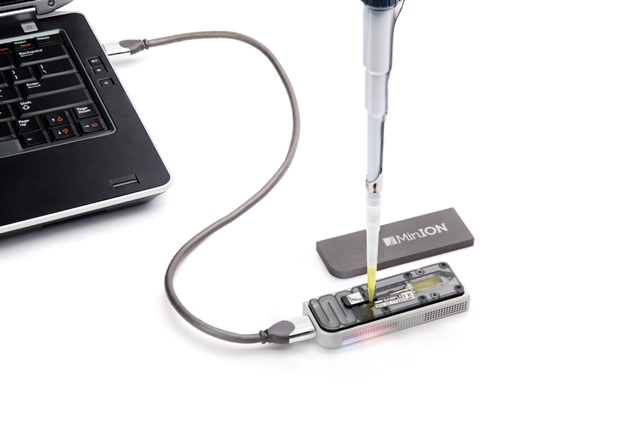 Oxford Nanopore (ONT) sells an amazing, inexpensive sequencer called the MinION. It's an unusual device in that the sequencing "flowcells" use protein pores. Unlike a silicon chip, the pores are sensitive to their environment (especially heat) and can get damaged or degraded and stop working. When you receive a flowcell from ONT, only a fraction of the possible 2048 pores are active, perhaps 800–1500. Because of how the flowcell works, you start a run using zero or one pores from each of the 512 "channels" (each of which contains 4 pores). All told, this means it's quite difficult to tell how much sequence you can expect from a run. If you want to sequence a plasmid at 100X, and you are starting with 400 pores, will you get enough data in two hours? That's the kind of question we want an answer to. For testing purposes — and because I don't have nearly enough real data — I will simulate some data. In this toy example, DNA of length 1000+/-50 bases is sequenced for 1000, 20000 or 40000 seconds at 250bp/s. After 100 reads, a pore gets blocked and can no longer sequence. The device I am simulating has only 3 pores (where a real MinION would have 512). To help figure out how long to leave our sequencer running, I made a MinION simulator in a jupyter notebook. I then turned the notebook into an app using dappled.io, an awesome new service that can turn jupyter notebooks into apps running on the cloud (including AWS lambda). 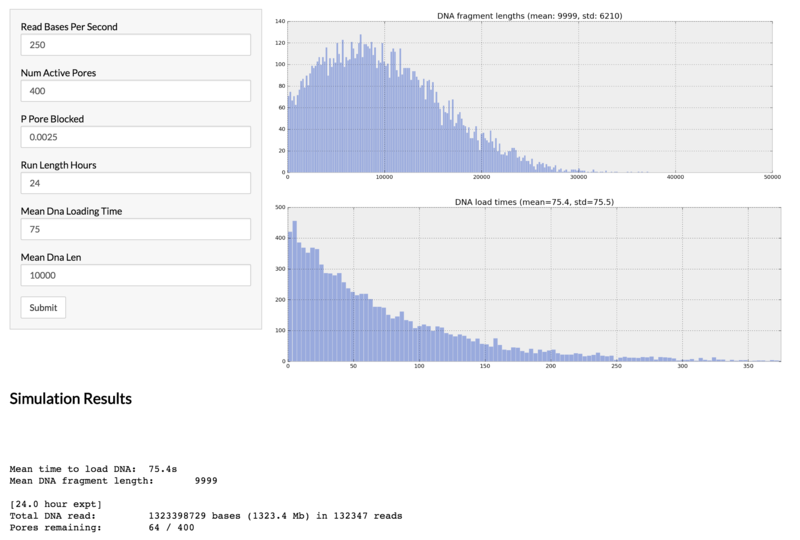 Here is the dappled nanopore simulator app / notebook. Nevertheless, the simulator is a useful tool for ballparking how much sequence we should expect from a run. In theory, given some data from real MinION runs, we should be able to learn the parameters for a model that would enable us to predict how much data we would get from a new run. Like many problems, this is a good fit for Bayesian analysis, since we have data and we want to learn the most appropriate model given the data. I'll use PyMC3 for this problem. First, I need to specify the model. The length of input DNA is different to the length of reads produced by the sequencer, which is affected by breakage, capture biases, secondary structure, etc. The relationship between input DNA length and read length could be learned. We could get arbitrarily complex here: for example, given enough data, we could include a mixture model for different DNA types (genomic vs plasmid). A simple distribution with small variance but fat tails seems reasonable here. I don't have much idea what the standard deviation should be, so I'll make it a fraction of the mean. Absent better ideas, I'll generally be using a T distribution instead of a normal, as MacKay recommends. This distribution should be truncated at zero, but I can't do this for multidimensional data because of what I think is a bug in pymc3. I am not modeling the input_dna_len here, just the mean of that distribution. As I mention above, the distribution of DNA lengths could be modeled several ways, but I currently only need the mean in my model. shape=1: this is a scalar value. For example, we might think the speed of the nanopore machine is the same for all runs. shape=data.shape: data.shape is the number of runs. For example, the length of DNA in solution varies from run to run. shape=(data.shape,MAX_NUM_PORES): we estimate a value for every pore in every run. For example, how many reads until a pore gets blocked? This varies by run, but needs to be modeled per pore too. I know that the R9 pore is supposed to read at 250 bases per second. I believe the mean could be a little bit more or less than that, and I believe that all flowcells and devices should be about the same speed, therefore all runs will sample from the same distribution of mean_read_speed. DNA is flopping around in solution, randomly entering pores now and then. How long will a pore have to wait for DNA? I have a very vague idea that it should take around a minute but this is basically an unknown that the sampler should figure out. Note again that I am using the mean time only, not the distribution of times. The actual distribution of times to capture DNA would likely be distributed by an exponential distribution (waiting time for a Poisson process). This is the first time I am using a hierarchical/multilevel model. For more on what this means, see this example from pymc3 or Andrew Gelman's books. 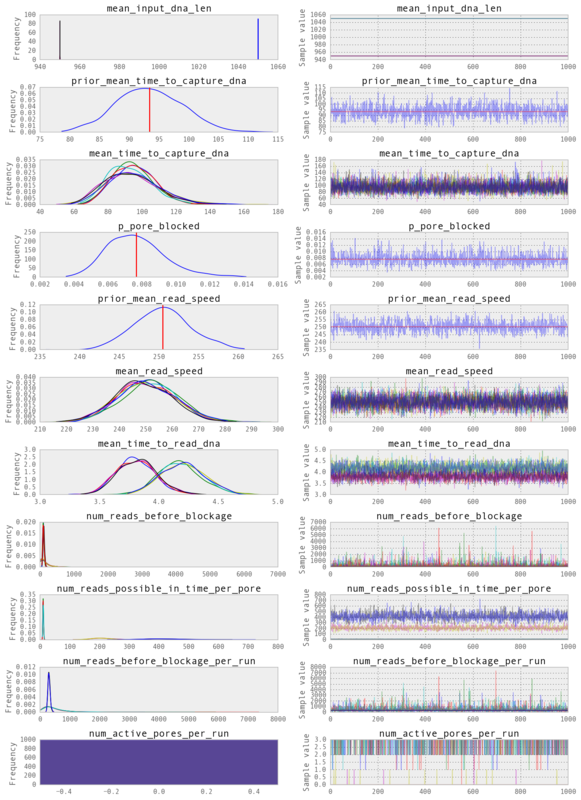 There are three options for modeling mean_time_to_capture_dna: (a) it's the same for each run (e.g., everybody us using the same recommended DNA concentration) (b) it's independent for each run (c) each run has a different mean, but the means are drawn from the same distribution (and probably should not be too different). Then each pore can do how many reads in this run? I have to be a bit careful to specify that I mean the number of reads possible per pore. In my model, after each read ends, a pore can get blocked, and once it's blocked it does not become unblocked. I believe about one in a hundred times, a pore will be blocked after if finishes sequencing DNA. If it were more than that, sequencing would be difficult, but it could be much less. We can think of the Beta distribution as modeling coin-flips where the probability of heads (pore getting blocked) is 1/100. Then, per pore, the number of reads before blockage is distributed as a geometric distribution (the distribution of the number of tails you will flip before you flip a head). I have to approximate this with an exponential distribution — the continuous version of a geometric — because ADVI (see below) requires continuous distributions. I don't think it makes an appreciable difference. Here the shape parameter is the number of runs x number of pores since here I need a value for every pore. Here things get a little more complicated. It is not possible to have two random variables x and y, set x + y = data, and sample values of x and y.
I was surprised by this at first but it makes sense. This process is more like a regression where you minimize error than a perfectly fixed constraint. The smaller the standard deviation, the more you penalize deviations from the constraint. However, you need some slack so that it's always possible to estimate a logp for the data given the model. If the standard deviation goes too low, you end up with numerical problems (e.g., nans). Unfortunately, I do not know of a reasonable way to set this value. Using your own DensityDist allows you to use any function as a likelihood. I use DensityDist just to have more control over the likelihood, and to differentiate from a true Normal/Laplacian distribution. This can be finicky, so I've had to spend a bunch of time tweaking this. The total DNA I have read must be the product of mean_input_dna_len and total_num_reads. mean_input_dna_len can be different to my estimate. This is a bit redundant since I know total_num_reads and total_dna_read exactly. In a slightly more complex model we would have different mean_read_length and mean_input_dna_len. Here it amounts to just calculating mean_input_dna_len as total_dna_read / total_num_reads. To calculate this, I compare num_reads_before_blockage and num_reads_possible_in_time_per_pore. Then I take the minimum value of these two arrays (T.lt) and if the minimum value is the number of reads before blockage (T.switch(T.lt(f1,f2),0,1)) then that pore is blocked, otherwise it is active. I sum these 0/1s over all pores (axis=AXIS_PORES) to get a count of the number of active pores for each run. The value of this count is constrained to be equal to data['num_active_pores_end']. Using the same matrix num_reads_possible_in_time_broadcast this time I sum the total number of reads from each pore in a run. I simply sum the minimum value from each pore: either the number before blockage occurs or the total number possible. 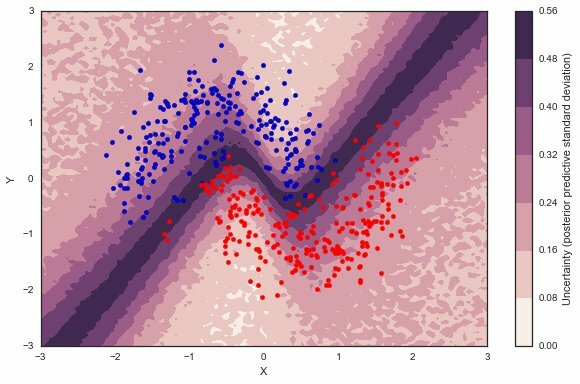 ADVI: this is "variational inference", the new, fast way to estimate a posterior. This seems to work great, though as I mention above, it needs continuous distributions only. I used ADVI most of the time in this project, since NUTS was too slow and had more numerical issues than ADVI, and the ADVI results seemed more sensible than Metropolis. In my toy model: there are 8 runs in total; each device has 3 pores; it takes about 4 seconds to sequence a DNA molecule (~1000 bases / 250 bases per second) and 96 seconds to capture a DNA molecule (so 100 seconds in total to read one DNA molecule). In my 8 runs, I expect that [10, 10, 10, 10, 200, 200, 400, 400] reads are possible. However, I expect that runs 4, 5, 6, 7 will have a blockage at 100 reads. Finally, I expect there to be 3 pores remaining in the first four runs, and 0 pores remaining in the last four. mean_input_dna_len__0                    950.0 (+/- 0.1) # All the input_dna_lens are ok.
num_reads_before_blockage_per_run__1     509.8 (+/- 543) # is highly variable when there is no blockage (runs 0-3). We can plot the values above too. No real surprises here, though num_active_pores_per_run doesn't show the full distribution for some reason. It's a pretty complex model. Is it actually useful? I think it's almost useful, but in its current form it suffers from a lack of robustness. A big problem with my current model is that scaling it up to 512 pores seems to be difficult numerically. Metropolis just fails, I think because it can't sample efficiently; NUTS fails for reasons I don't understand (it throws an error about a positive definite matrix); ADVI works best, but starts to get nans as the number of pores grows, unless I loosen the constraints. It's possible that I should need to begin with loose constraints and tighten them over time. Finally, the model currently expects the same number of pores to be available for every run. I haven't addressed that yet, though I think it should be pretty straightforward. There may be nice theano trick I am overlooking. Without ADVI, I think I would have failed to get an answer here. I'm pretty ignorant of how it works, but it seems like a significant advance and I'll definitely use it again. In fact, it would be interesting to try applying Edward, a variational inference toolkit with PyMC3 support, to this problem (this would mean swapping theano for tensorflow). The process of modeling your data with a PyMC3/Stan/Edward model forces you to think a lot about what is really going on with your data and model (and even after spending quite a bit of time on it, my model still needs quite a bit of work to be more than a toy...) When your model has computational problems, as I had several times, it often means the model wasn't described correctly (Gelman's folk theorem). Although it is still a difficult, technical process, I'm excited about this method of doing science. It seems like the right way to tackle a lot of problems. Maybe with advances like ADVI and theano/tensorflow; groups like the Blei and Gelman labs developing modeling tools like PyMC3, Stan and Edward; and experts like Kruschke and the Stan team creating robust models for us to copy, it will become more common. This is a short list of interesting projects, companies and technologies I've been following. Transcriptic is still the only programmable cloud lab currently open for business. My previous blogpost has a lot more on this company. They're continuing to add capabilities, including magnetic bead operations, which enables a lot of new kinds of experiments. After several years in stealth, Vium (formerly Mousera) just launched this week. Essentially, Vium have "smart home" mouse cages that stream data directly to you. You can control the mouse's environment remotely and get video, humidity and temperature readings in real-time. Perhaps most importantly, you can start to analyze the data almost immediately, whereas with a regular CRO, you might have to wait months for the trial to finish. That just speeds everything up. The advantages of this model are potentially enormous. I'm especially excited about the potential for adaptive trials: imagine administering 10 candidate drugs to 50 mice on day one, and discontinuing ineffectual drugs when your Bayes Factor drops below some threshold. The speed and cost advantage could be great. IndieBio is an accelerator/VC fund that funds a lot of different kinds of lean biotech. A lot of it is hard-to-categorize stuff that neither typical biotech VCs nor tech VCs fund (probably most have no idea what you are talking about). IndieBio especially focuses on sectors like food tech, agriculture and cosmetics, (or perhaps more broadly, biotech that's not a drug or a diagnostic). These industries are enormous though, and the opportunities are huge. Their demo day videos (2015, 2016) have an extremely varied group of pitches, from 3D printed rhino horns to neuron-based computers, and are definitely worth checking out. There's really too much going on with Oxford Nanopore to effectively summarize here. I might have to write a whole post or something. Oxford's CTO, Clive Brown, gave a talk at London Calling that that describes their roadmap, and it includes incredible things like sequencers that attach to your iPhone, portable all-in-one sample prep, and DNA synthesis. The next year or two is going to be very interesting for Oxford. Continuum Analytics is Travis Oliphant's new company (of numpy fame), and it produces some of the most useful software for scientific Python. Continuum also have plotting libraries (bokeh), big data libraries (dask) and more. I haven't used these much, but I'd presume they are all high quality. Tensorflow is a library that is hard to explain, but basically takes numerical expressions that you define in Python, and does matrix math for you, including things like calculating gradients. Because of its design, it can distribute the work across computers, and across CPUs and GPUs. Theano and Tensorflow are very similar: you can even use Tensorfuse as a common interface to both. Theano was first, but Tensorflow seems to be winning for the moment. Tensorflow has some advantages like integration with mobile devices (I don't think that really exists yet, but it's coming). Although Theano and Tensorflow are best known as deep learning libraries, they do a lot more than that. One nice feature of building on Theano/Tensorflow is that you can write in pure Python, and let the library figure out the best way to compute everything. Deep learning requires a lot of matrix multiplications and gradient calculations. Hence there are lots of deep learning libraries built on Theano/Tensorflow, and new ones pop up all the time. My favorite is keras, because it's in Python, high-level, well documented, and works with both Theano and Tensorflow. PyMC3 is a "probabilistic programming" library similar to Stan (an MCMC workhorse from Andrew Gelman's lab), but in Python. Frankly, it's not nearly as polished or popular as Stan, but because it's built on Theano and scipy, the code is very short and readable Python, which is a big plus for me. It's extensible in ways Stan just can't be. Like Stan, PyMC3 now supports faster-than-MCMC Variational Inference (ADVI). This blogpost, from @twiecki, one of the PyMC3's core developers, shows the power of building on Theano. In just a few dozen lines of Python, he builds a Bayesian neural net and solves it with ADVI. It's not super-practical, but a very interesting result. Edward is a very interesting project that I won't claim to fully understand. It's a probabilistic modeling library built on Tensorflow, that somehow manages to include the ability to use models defined in PyMC3, Stan, or keras. It's a pretty amazing project, and I like their explanation of Box's loop (due to Edward Box) of modeling, reasoning, and criticism. It's also notable for how it shows the convergence of multiple related inference tools into simple, high-level code that sits on top of industrial-strength libraries like Tensorflow.